National Anti-Bullying Week takes place every year. The week provides an opportunity for everyone to campaign against and raise awareness of bullying. This year National Anti-Bullying Week is taking place from Monday 17th November until Friday 21st November. The theme this year is 'let's stop bullying for all'. Make sure your school gets involved in the week by signing up to one of our events or running some of the fun and easy activities listed below. 1) Design an app competition - Hold a competition amongst the different classes in the school to see who can design the best anti-bullying app. The app must be child friendly, safe to use and educate young people about bullying in a fun way. This is a good opportunity to get your students talking and thinking about internet safety. The winning team can present their idea in assembly. You could also ask the local police to come and talk about online safety and cyber-bullying. Definition: Apps is an abbreviation for application. An app is a piece of software. It can run on the Internet, on your computer, or on your phone or other electronic device. 2) Celebrate diversity - Show the diversity in your school by holding a diversity evening. Ask pupils to talk about what makes them different and ask different talent to perform at the event. You could also use it as a way to raise money for your school’s anti-bullying work. 3) Anti-Bullying parade – Hold an anti-bullying march around the playground. 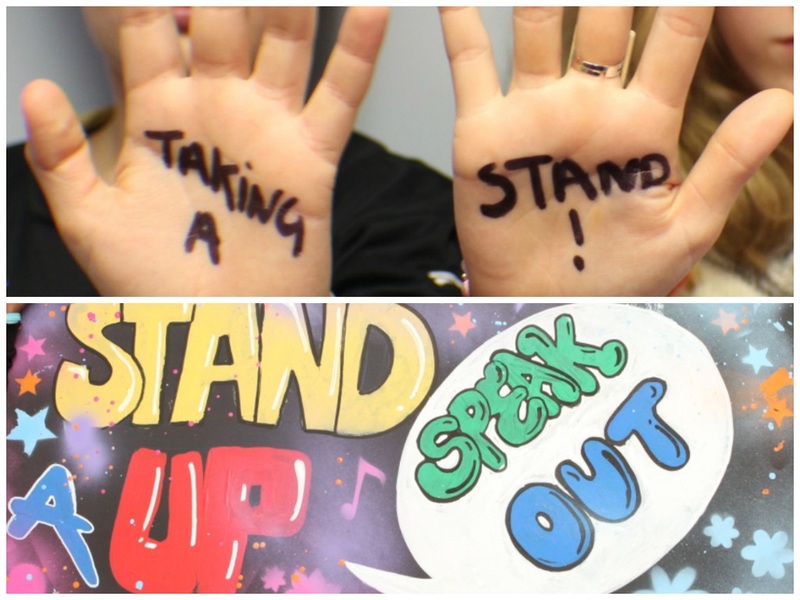 Get your students to design posters and signs with anti-bullying slogans and pictures. 4) Whole school anti-bullying poem – Decide on a topic for the poem. Ask each class to write a section of the anti-bullying poem, put them all together at the end of the week to create a whole school poem. Display the poem in a main section of the school. 5) Re-write your school’s anti-bullying policy – Re-write your schools anti-bullying policy to make it child friendly. You may choose to use a video or pictures to show the policy. 6) Anti-bullying pledge – Ask each pupil to write and design an anti-bullying pledge stating what they will do to tackle bullying in their school. Create a display of these pledges. If students misbehave remind them of their pledge. 7) Launch a bullying reporting system – Anti-Bullying Week is a great time to check if your students know who to talk to in the school if they are being bullied. Think of ways they can report bullying anonymously. This may involve launching an email address or number they can call. Design cards with these details on and hand them out to students. 8) Primary – Ask your students to write down words or comments that make them happy and words and comments that make them sad. Discuss why these words and comments may make them happy/sad and create a visible list of words and comments you do and do not want to hear in school. Secondary – In pairs ask your students to research a bullying issue that has been in the news and choose a relevant article. Ask them to write a summary of the article to share with the class. Back in the classroom ask students to discuss their articles. 9) Anti-bullying hero/heroine fancy dress day - On the last day of National Anti-Bullying Week hold an anti-bullying hero/heroine day. The idea being that students come in in fancy dress as their childhood heros/heroines and talk about how they will be someone else’s hero in school. 10) Wristbands – Buy our BRAND NEW Anti-Bullying Ambassador wristbands and sell them at your school to fundraise. Older PostThe 2014 Youth Board Meet for the First Time!